As far back as I can remember, I have always been competitive. Losing at anything was incredibly difficult regardless of if it was a sport, game, debate, or heated discussion. In fact, I would rather not play if I wasn’t confident that I could win. Possibly one of the biggest mistakes I made was not realizing that failures play a crucial role in future success. It took a significant amount of time for me learn this lesson and now that I have, I’d rather my two boys learn it early. What may be the most significant marks of greatness that George Washington left us with, is his humility that he displayed in two remarkable ways. He declined to become a functional King after the American Revolution – There was a moment after the Revolution that George Washington could have become the most powerful man in the newly formed America. However, he declined, in humility, recognizing that he would not become the very thing he fought against. In fact, by declining power, George Washington became the first military leader to win a war and then voluntarily step down from leadership. He declined a 3rd term in office – This precedent that Washington set has lasted hundreds of years. Washington’s determination to step down from leadership is an example of incredible humility and personal conviction. When George Washington died on December 14th, 1799, out of respect, more than sixty British ships lowered their flags to half-mast. One British soldier stated that this was done out of respect for the man who, “out generaled” them. Washington’s response to his first major failure on May 1754 played a crucial role in his life.There is certainty that we will all experience failures in our lives. The most important decision is what we do with our failures. My hope and prayer would be that my boys would become stronger and learn from their failures. That the failures they experience would instill in them a sense of humility. 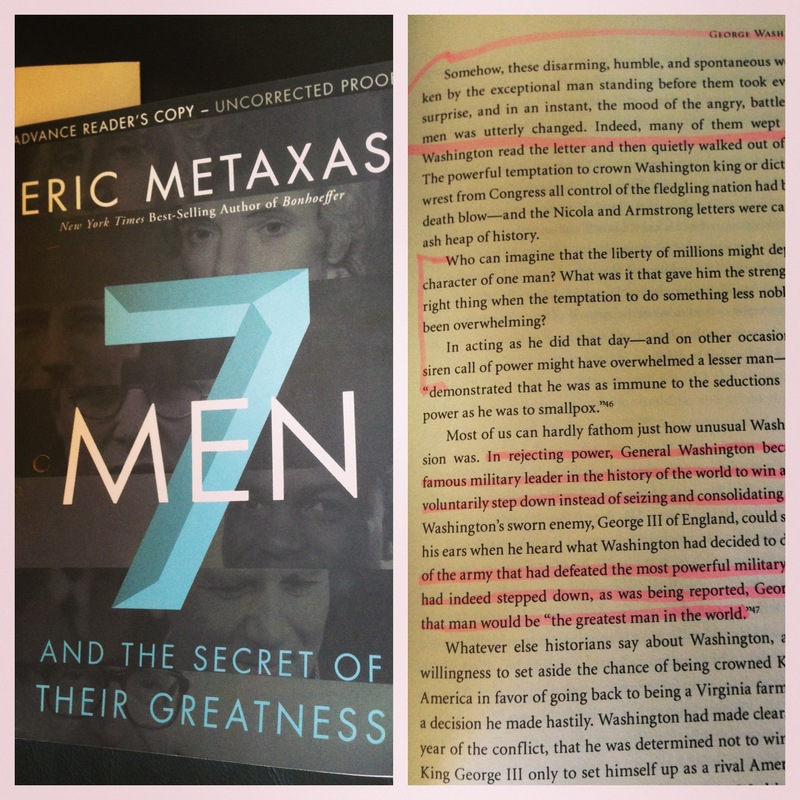 This entry was posted in Leadership and tagged 7 Men, Eric Metaxes, George Washington, Leadership by jmuddamalle. Bookmark the permalink.